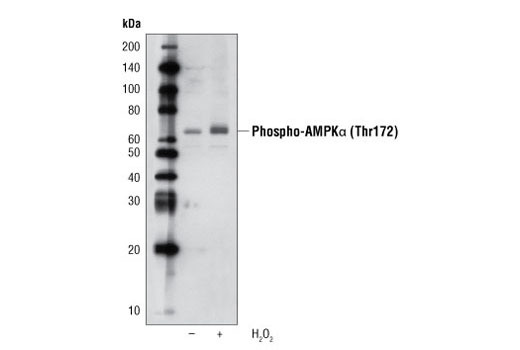 Western blot analysis of extracts from C2C12 cells, untreated (-) or hydrogen peroxide-treated (+), using Phospho-AMPKα (Thr172) (40H9) Rabbit mAb (Biotinylated). Western blot analysis of extracts from oligomycin-treated (0.5 µM) 293 cells either untreated (-) or λ phosphatase (+), using Phospho-AMPKα (Thr172) (40H9) Rabbit mAb (Biotinylated). 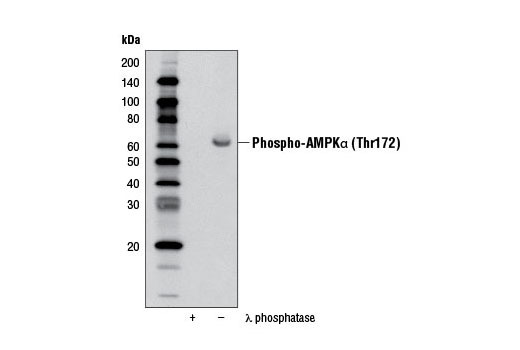 Phospho-AMPKα (Thr172) (40H9) Rabbit mAb (Biotinylated) detects endogenous AMPKα only when phosphorylated at Thr172. The antibody detects both α1 and α2 isoforms of the catalytic subunit, but does not detect the regulatory β or γ subunits. This Cell Signaling Technology antibody is conjugated to biotin under optimal conditions. The biotinylated antibody is expected to exhibit the same species cross-reactivity as the unconjugated Phospho-AMPKα (Thr172) (40H9) Rabbit mAb #2535.